Introduction: In today�s ever connected world it seems like tech is integrated into everything we do, including how we fish and share those experiences. 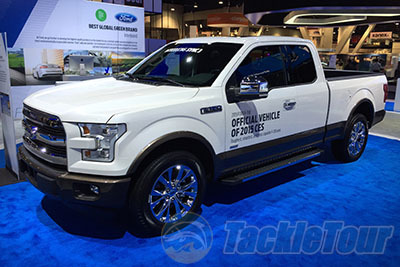 We take a trip to the Consumer Electronics Show (International CES) to check out what hi-tech manufacturers had to offer anglers and outdoor enthusiasts. 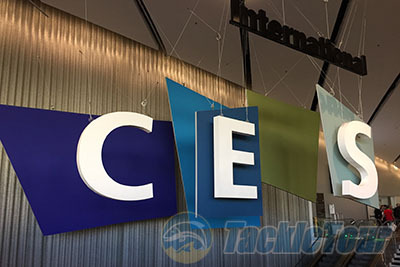 For those anglers that are not familiar with CES is held at the Las Vegas convention center every year, the same venue as ICAST, and showcases more than 3600 exhibitors including manufacturers, developers and suppliers of consumer technology hardware. It covers a very wide spectrum of applications including fitness and sports, automotive technology, photography, content creation and distribution, video and wearables. Going back through time some of the technology that we use each and every day has been unveiled at CES and examples include the 3D HDTV (2009), Blueray DVD (2003), Plasma TV (2001), Microsoft XBOX (2001), CD players (1981), and even the VCR (1970). More and more anglers are embracing cutting edge technology to give them an edge when they fish, just think about the latest advancements in GPS and fishfinder technology and units we used to employ just 5 years ago seem archaic and as social media has fueled sharing of images and videos there are a mind boggling number of cameras designed specifically to document outdoor adventures. 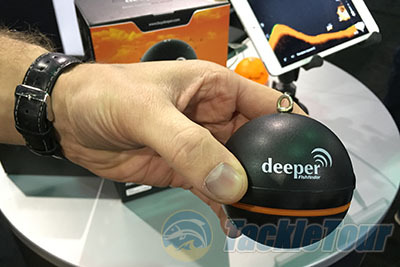 Deeper Fishfinder: The Deeper fish finder is a unique portable wireless sonar that is controlled with your smartphone (6000+ iOS and Android) and is specifically designed to find the location of fish, depth, water temperature, bottom contours and more. 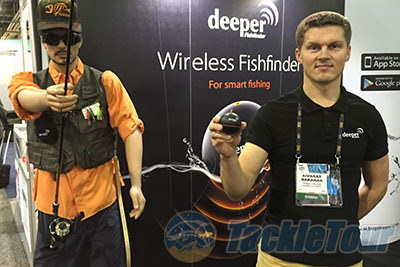 We first got a glimpse of the Deeper Fishfinder at this past ICAST in Orlando, since then the product has only matured and is now available with a much wider range of accessories making it possible to employ the device in a wider range of angling applications. With a weight of only 100grams and a 2.6� diameter Deeper is smaller and lighter than any other traditional sonar and can fit into your tackle box or fishing jacket so it is easy to take it with you and employ it in places where other sonars are hard to deploy, like from shore, over ice, on a dock or kayak for example. It can be cast on the end of your line to give you a preview of what is in the strike zone before you dunk your lure/bait and can report depths up to 130 feet with a range from your device up to 160 feet. 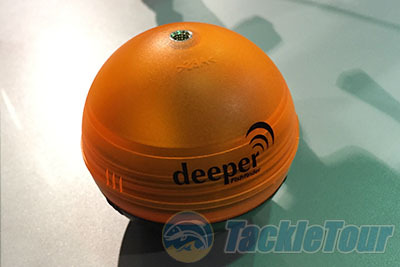 Deeper�s dual frequency feature allows for observation of the underwater at all depths in 90 kHz (55�) and 290 kHz (15�) radius. Wide beam provides ample search area for fish, bait fish and structure. Precise narrow beam gives high accuracy returns of fish, structure, detail and bottom profile. With Deeper you can both cast wide or focus on the bottom. New accessories include a new clamp ($59) that features a universal � 20� (quarter twenty) male screw that makes it compatible with RAM mounts and can hold the module perfectly on kayaks and canoes. Another new accessory are the special night covers ($35) which swap a transparent cover with the standard black one and allows anglers to have a light up visual indicator of where the Deeper module is on the water. 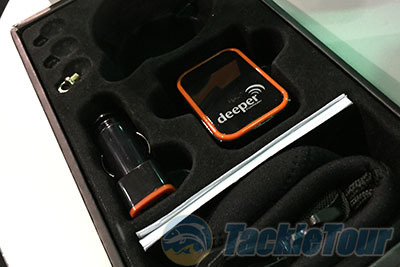 The Deeper fish finder comes with everything you need to charge and deploy the fishfinder and is available now from e-tailers including Amazon.com and Cabelas for $299 dollars. Parrot Bebop: It is the attack of the drones! 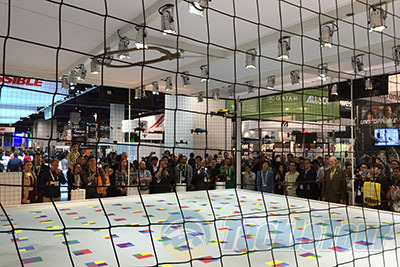 At the show drone manufacturer Parrot had a series of new Bebop drones dance in unison for five minutes, performing coordinated aerial maneuvers in the center of the booth. 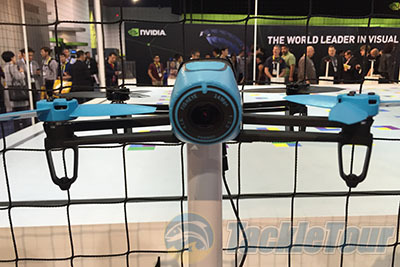 These drones are designed to record whatever we want in outdoors. Imagine fishing on your boat while the Bebop is recording everything from cast to landing a fish over the water or even from hundreds of feet above. The Parrot Bebop Drone has a stabilized 14 megapixel fisheye camera, can record video in full HD 1080p and even has a GPS embedded for automatic return home! The drone is easily controlled with an app installed on a smartphone or tablet and so that you get the very best footage it can live stream exactly what it is seeing to your handheld device with a Wi-Fi MIMO range up to 300m/984 feet. 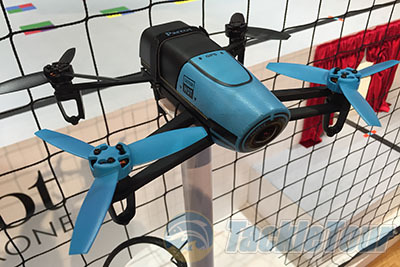 The Parrot Bebop is just becoming available now and will retail for $499 dollars each.